Seeking a fantastic incense all your own? You found it, Cancer, and you probably knew that because you are known to be psychic! Cancers were born between June 21st and July 22nd under the sign of the Crab. According to Greek mythology, the crab was a sent by Goddess Hera to aid the Hydra in killing Hercules. Although Hercules managed to kill both creatures, Hera rewarded the crab for its services by placing its image in the night sky. Under the of element of Water, you are intuitive and emotional. You are known to be compassionate in your communications and relationships. As a natural nurturer, you know how to take action and work through a situation with compassion and care. You are fortunate, for you feel connected to those you love and like to keep the peace. You are imaginative and artistic. You love to paint, write or in some way, enjoy your creative talents. You are a homebody at heart, and somewhat traditional. The most compatible signs with Cancer are generally considered to be Taurus, Virgo, Scorpio and Pisces. But you can be friends with anyone. You are ruled by the Moon which is the only sign in the Zodiac that sees its ruler every month. You prefer a feeling of security and consistency rather than chaos and craziness (yes, some people really do like chaos and craziness) and have an intuitive grasp of carving out your own territory in the world. You are ruled by your chest, breast and stomach. You may occasionally suffer from indigestion. 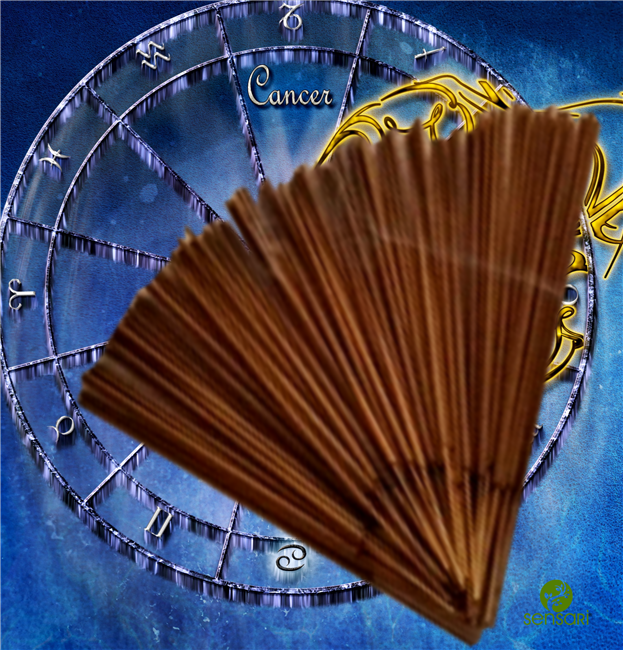 Your specific Cancer incense scent is a blend including Ylang Ylang and vanilla. A perfect combination for you, loving Cancer. Lovely to burn as you carry on tradition and be with family since this combination of scents supports those desires. Use it anytime: day or night, work, play or meditation. As you nurture and use your intuitive abilities, enjoy the incense made just for you! Other Cancers include: Kathie Bates, Helen Keller, Nelson Mandela, Sylvester Stallone, Meryl Streep and Tom Hanks. We've created an individual scent for each of the Zodiac signs. Might someone you love enjoy a scent made just for them on their birthday?